Pre Draft Report: Greene’s calling card in the 2011 draft was his raw power which was rated by many to be the best in the draft. Greene is a physical monster who received a scholarship offer to play linebacker at the University of Alabama. He is an average runner but could lose speed as he matures, he played centerfield in high school but will play left field in the minors and could have to move to first base in the future. The knock against Greene was the lack of quality competition he faced in high school, additionally Greene struggled against plus velocity in showcase games. He grades as a late first round pick and the Phillies selected him in the supplemental first round, #39 overall. Career Synopsis: Greene signed late and did not play until Florida Instructional League but was very limited by a groin injury. He was ranked the #20 prospect in the organization by Baseball America and the #7 prospect by Kevin Goldstein at Baseball Prospectus. Greene showed up in 2012 out of shape and was held back in Extended Spring Training before being assigned to Short Season Williamsport. Greene showed an impressive amount of plate discipline, but also a lot of swing and miss (14% BB rate and 26% K rate). The power display was not impressive as Greene only hit 2HR on the season, however his 22 doubles were 3rd in the league behind teammate Serritella and Perkins. Greene’s final stat line was .272/.373/.381. Summary: Greene is a huge man and is incredibly athletic for his size. Right now Greene still has the speed and arm to be a good left fielder. Greene has huge raw power but he has yet to show it in games, but he has shown a better ability to hit for average than previously shown. Upside: Greene has the ability to be an All-Star LF who could hit for a ton of power. Greene is still very raw and is learning how to translate his tools to in game power. His future in the outfield is determined by how big he will get, Greene is only 19 but already has a ton of mass on his frame. If he is limited to first base down the road his power should still play at the position. The Phillies have likened him to former prospect Jonathan Singleton with less hit tool but more power and defensive ability. Greene will go to Lakewood to start 2013 and has the ability to really take off as a prospect if he can tap into his power. Updated: The former first round pick went MIA after the 2014 season. He was rumored to have retired, and rumored to be returning after sitting out the 2015 season. He is still listed as inactive on MiLB.com. Something I don’t quite get about Greene: if he has such a strong throwing arm and isn’t a crappy runner yet, why aren’t they trying him in right field before left? I screwed up the throwing arm score, it would still play in right. His range was impressive in left than expected. The thinking I suspect is that they thought that he would play better there long term, but it is puzzling that they didn’t try him in right. Jon Mayo of MLB.com has LG at 6′, he is listed here at 6’2″, seems to be a discrepancy. Are there other publications with his height figure? 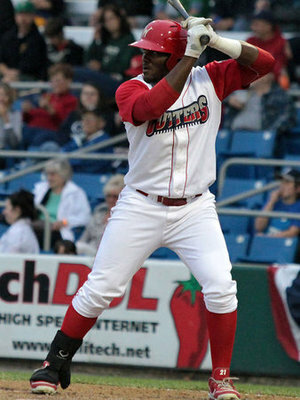 The Phillies’ top Draft choice in 2011 as a sandwich pick, the Georgia high school standout played his first pro ball in 2012 after signing late in 2011. Greene has plus raw power but has struggled to tap into it, adjusting to a higher level of play after high school competition that was a little lacking. He’s big and athletic and could handle left field but might be better suited to play first base when all is said and done. I will correct that, thanks for the proof read I must have miss typed it. Thanks for the correction- I still think it might have been worth a shot to try him in right before left, but it makes a lot more sense going direct-to-left for a tick-above-average arm than for a cannon. My only concern is the Phillies at some point deciding to try to convert LG into a first baseman later down the road, and not giving him substantial reps to adequately learn the position. Many of the national guys still project his future at first base. I can only assume that because he may gain weight as he ages. Not many players of his frame stick in the outfield long term so it is easier to go with precedent. I might be in the minority but I think he is a guy who cracks the majors as an outfielder and moves to first base later in his career (late 20s/early 30s) when the athleticism starts to leave him.